After a record breaking run of 718 days orbiting in space, we the public still have not got a clue what the mystery space craft mission. 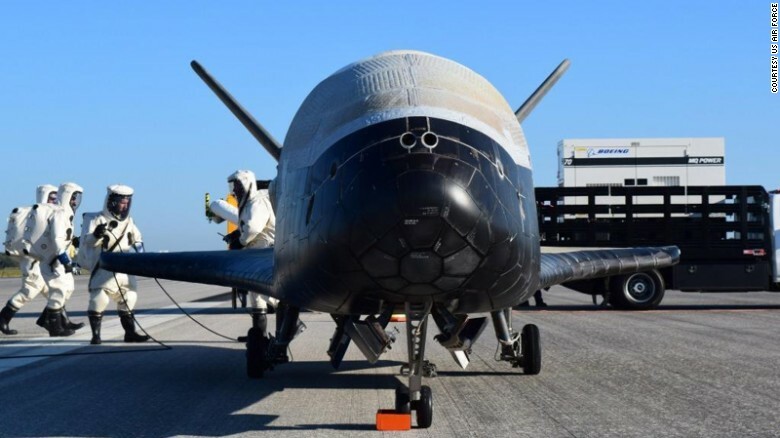 The X-37B is a space plane, that on cursory glance owes some heritage to the ancient Space Shuttle, but is clearly a different beast. It is alleged to be Robotic and Un-Manned, but who knows what capacities it really has for carrying people or pay loads as the program has been transferred to DARPA. NASA says its "an experimental test program to demonstrate technologies for a reliable, reusable, unmanned space test platform for the U.S. Air Force"
The X-37C is scheduled to be produced as a scaled up version of the Airforce X-37B, by about 175% bigger. With so little hard information, the press is indulging its creative writing skills, and every cult website has a wild theory. The more likely best less immediately stimulating or click baiting answer is that it really is just a test vehicle, and that its the yet to be built full size version, the X-37C that is the final product. Meanwhile the headline writers profit by dreaming in print ink fantasies of its secret 2 year mission.